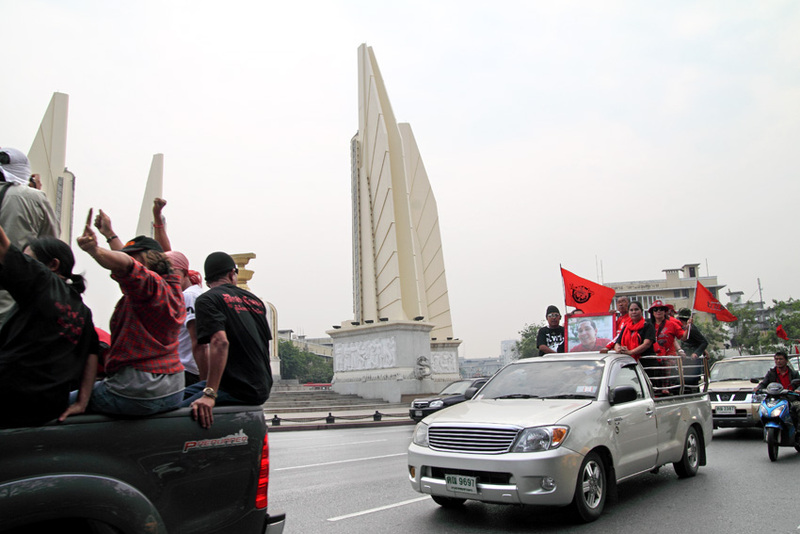 On 27 March 2011 I went to observe a small Daeng Siam/24 June group rally at Democracy Monument. 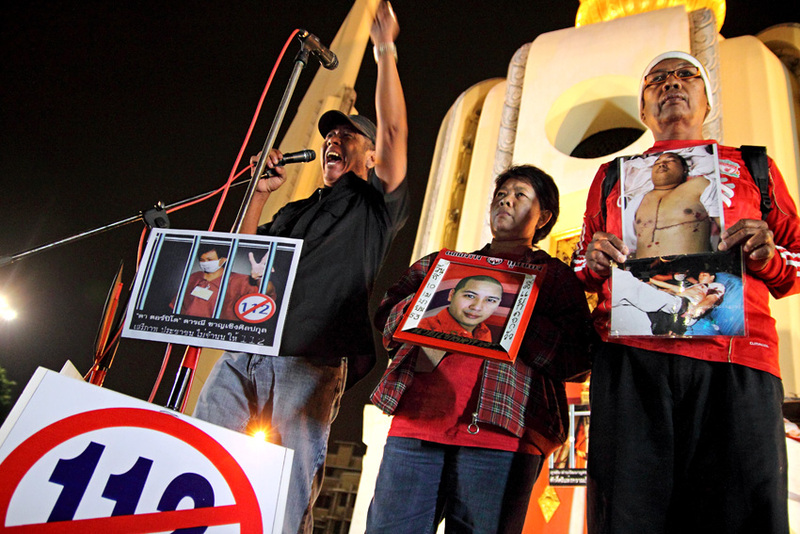 A couple came on stage, holding images up of their dead son – Terdsak Kungjinjan – who was killed at Kor Hua on 10 April last year. 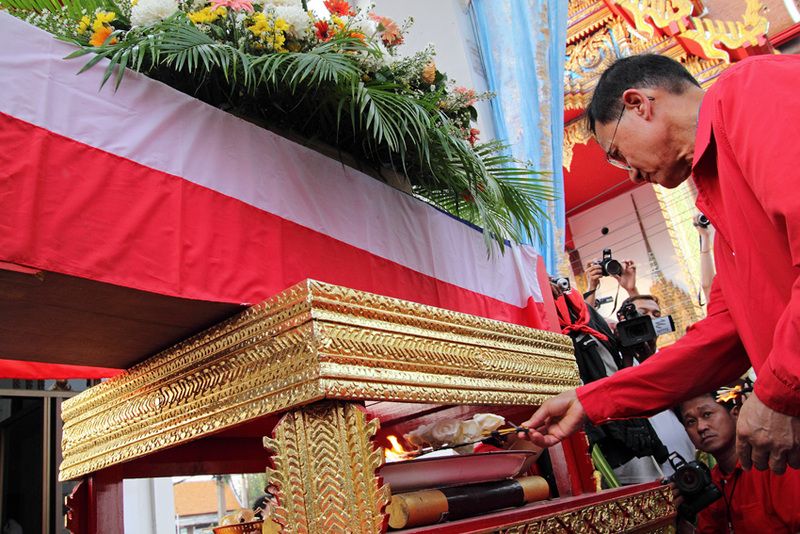 They announced on stage that on Saturday, 2 April, they planned to bring from its storage at Wat Phapphachai the coffin with their son to Kor Hua, to hold rites. After, they wanted to parade the coffin at Sukhumvit Soi 31, the entrance to the Soi of Prime Minister Abhisit Vejjajiva’s house (this was cancelled though), and then to proceed to Wat Si Kan in Don Muang, where the following day the funeral was to be held. Originally I planned to go on 1 April to the rally in Udon, but decided to only go after the rites at Kor Hua finished. 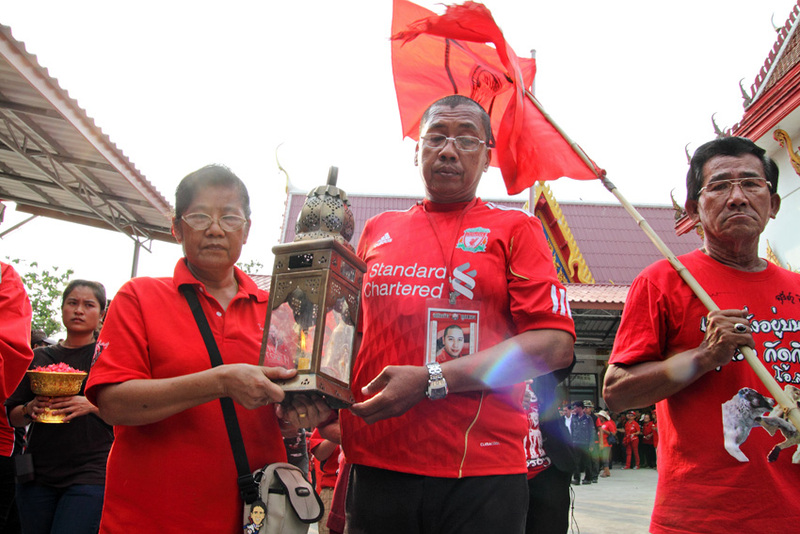 On 1 April, Saturday morning at 9 am, I went to Wat Phapphachai, where many Red Shirts were already gathered. 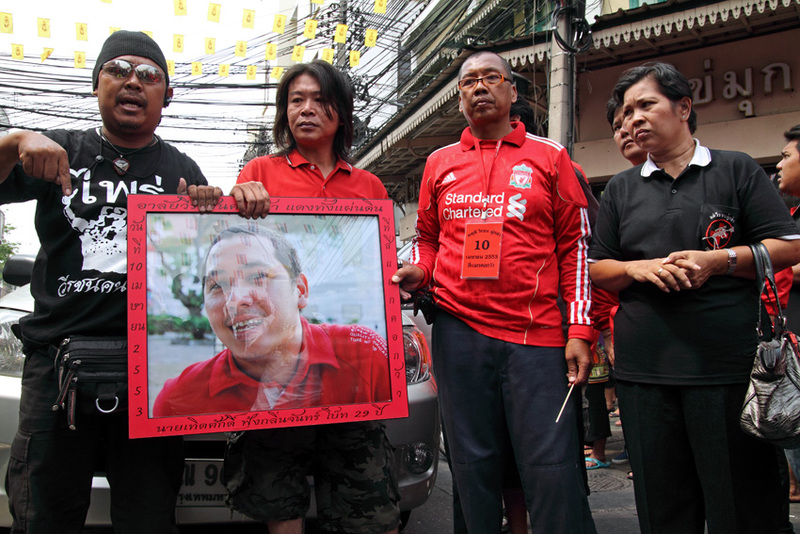 Terdsak’s parents thanked the abbot, who provided their son a cooling coffin free of charge, and soon the Red Shirt motorcade proceeded to Kor Hua. At the place where Terdsak died, they offered some food and incense sticks, asking his spirit to come along to the funeral. Through a loudspeaker, speeches blared. Shinawat Haboonpad, the owner of the Taxi Radio station who has recently returned from exile, took part as well. Soon the Red Shirts continued, and I went home and then to the airport where I got a flight to Udon Thani. I arrived in Udon just before sunset. The approach road was heavily jammed with Red Shirt vehicles. The Udon Lovers with their leader Kwanchai Paipanna held the 5 year anniversary of their community radio station. The last time I was there, the radio station was still in a rented building on a small leased plot of land. Since 2009 they have been gathering funds to buy their own plot of land, and to erect a larger building for their radio station. By now they had acquired an 18 rai plot of land on Udon’s outskirts, and a two storey building. They have about 5 million baht debt to pay, and part of their rally was to help raise funds. The grounds of their radio station were packed with people, my conservative estimate is between 60,000 and 80,000 Red Shirts who were gathered there – easily the largest Red Shirt rally since last year’s protests at Pan Fa and Rajaprasong. 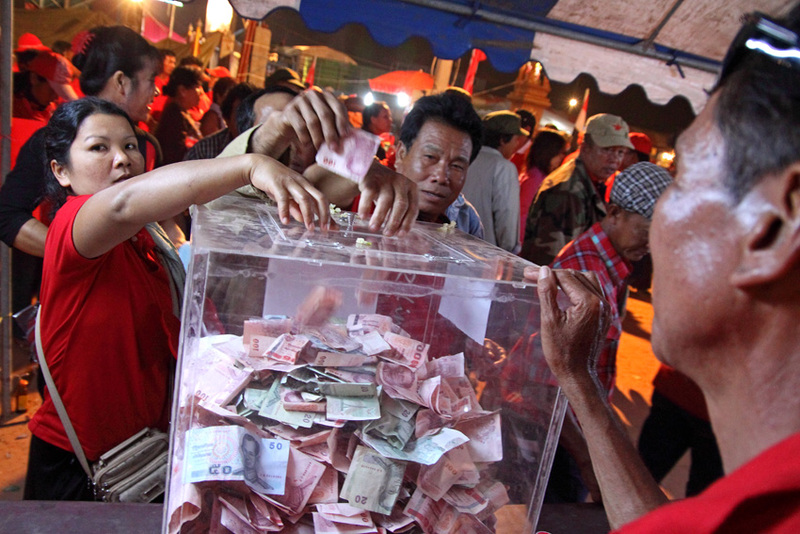 At the entrance were large donation boxes, in which people put mostly hundred baht and twenty baht notes (after counting the following day, the Udon Lovers received 1,180,000 baht from those boxes; stage and other expenses were supported by other supporters). 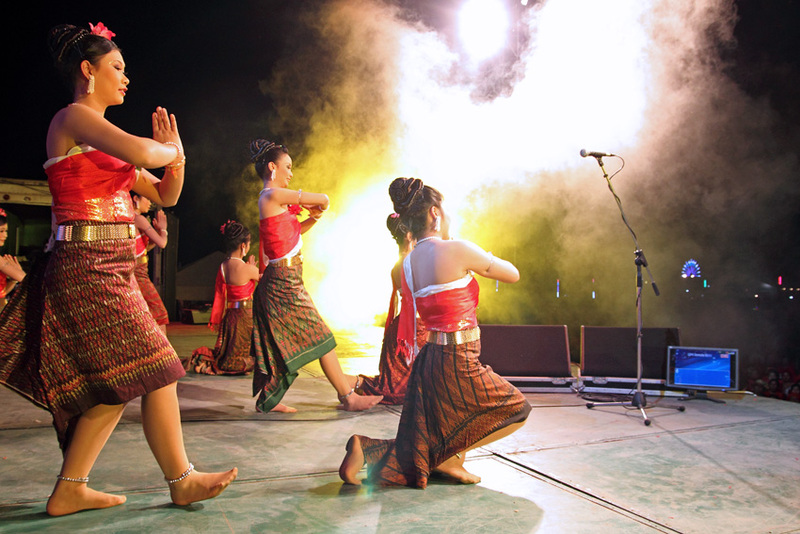 On the stage a group of dancers in traditional costume performed a dance. I climbed a loudspeaker tower to take images of the crowd. 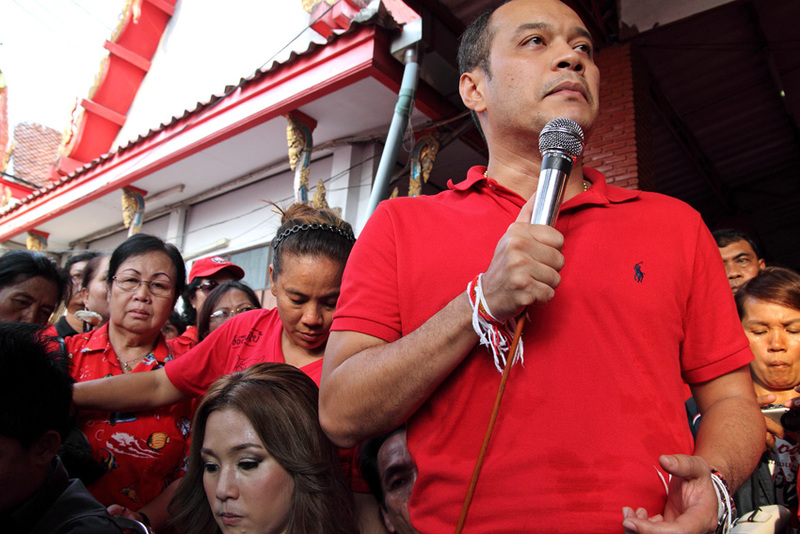 Most Red Shirt leaders were present, also many Pheua Thai MPs, alongside former Prime Minister Somchai Wongsawat. 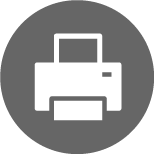 Former Prime Minister Thaksin Shinawatra was connected through a videolink. Several times I walked around the rally grounds, climbing again on loudspeaker towers to get more images of the crowd. 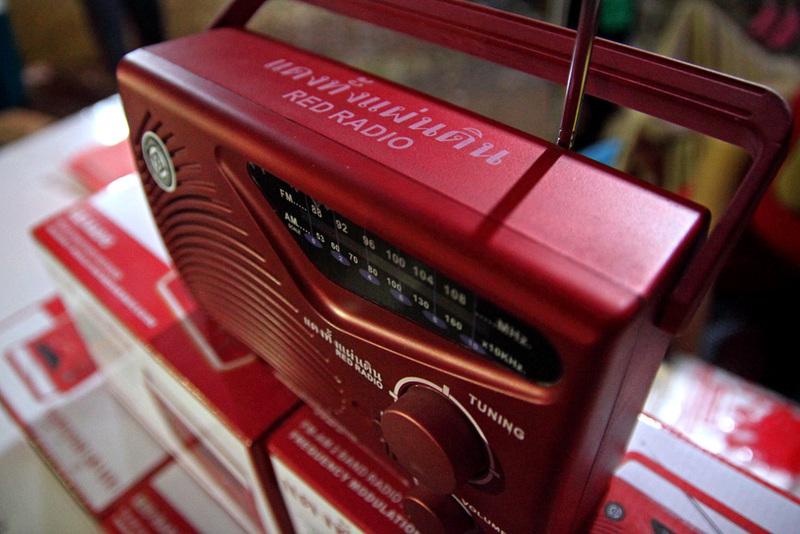 Behind the brightly lit new building of the radio station Udon Lovers staff sold “Red Radios” for 340 baht and Red mobile phones for 990 baht. 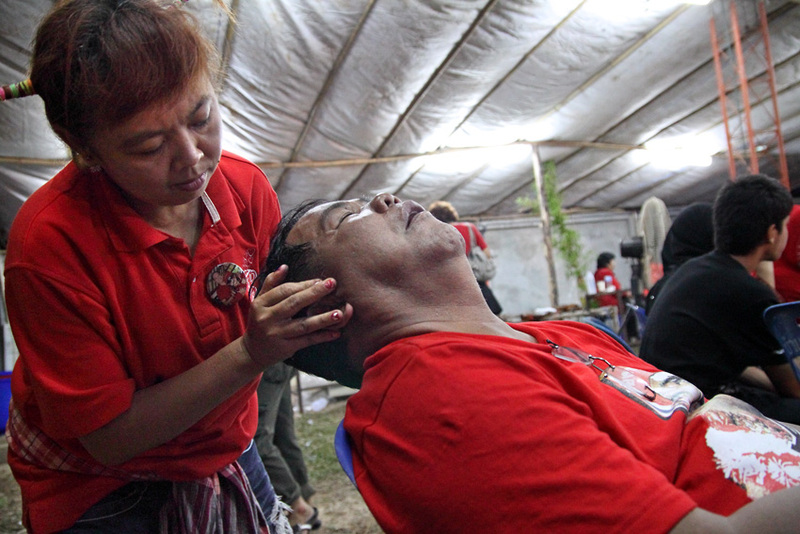 The last image I took that night was an exhausted Kwanchai receiving a head massage, I left shortly after midnight to catch a few hours more sleep, before I had to get to the airport and catch a plane back to Bangkok, to be in time for the funeral proceedings of Terdsak. At the rally in Udon I noticed no journalists other than Red Shirt media. There was no TV coverage; no coverage of this event in any newspapers I know of. I wonder how it can be possible that such a large event can go completely unnoticed by the local media? I understand that every small Red Shirt stage cannot be covered by the media (Daeng Siam stages are not covered at all, due to the sensitive subject matter), but isn’t the largest Red Shirt gathering since last year’s rallies a news event important to cover? The following day, Sunday, 3 April 2011, I went to Wat Si Kan in Don Muang. 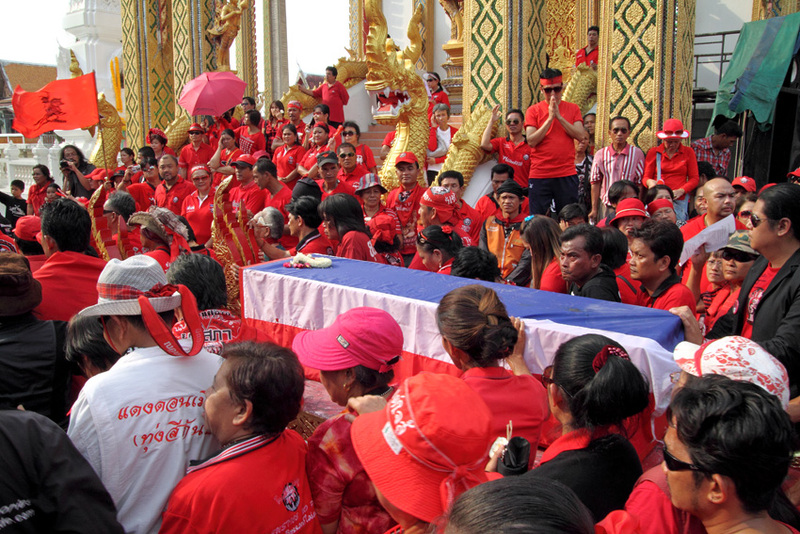 Several thousand Red Shirts had already gathered for the funeral. 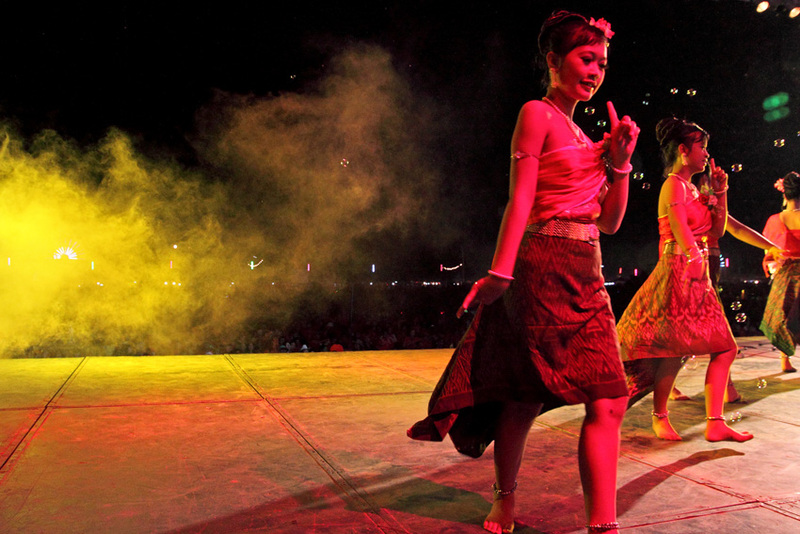 Many Red Shirt leaders have announced their participation, aswell as Veera Musikapong, whose bail restrictions of not being allowed to attend political gatherings of more than 5 people, not to leave Bangkok, and not to speak to journalists were lifted one day before the concert at Bonanza Khao Yai, where he appeared for the first time on the stage since Rajaprasong. A slightly unlucky situation could have developed as in the building just next to the funeral the military held their health check up and lottery for new conscriptees, but fortunately no incident occurred. 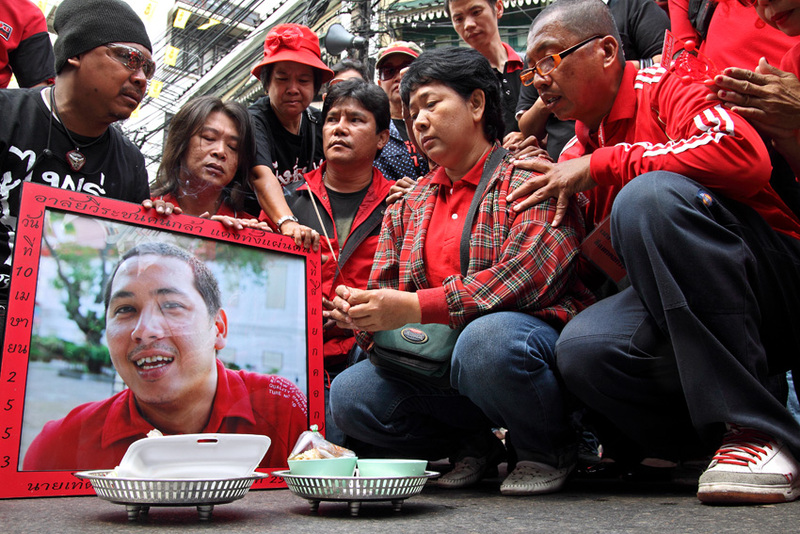 Not too long after the VIP guests arrived, including Somchai Wongsawat, Deputy House Speaker Apiwan Wiriyachai and Pheua Thai MP for Don Muang Karun Hosakul, and some of the most important Red Shirt leaders, the funeral proceedings began. The coffin was driven around the crematorium three times, and then carried up the stairs and placed in front of the crematorium. The VIP guests donated robes to the monks. 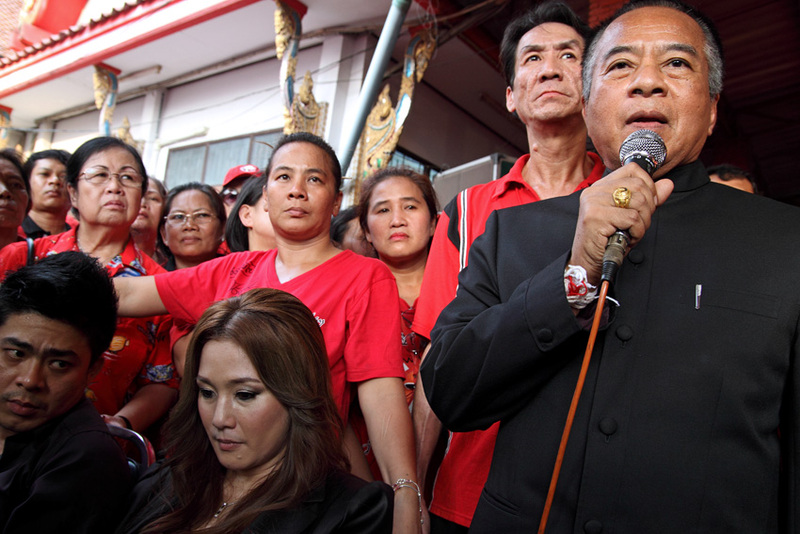 Red Shirt leaders held speeches (Nattawut mentioned “Ta Sawang”). 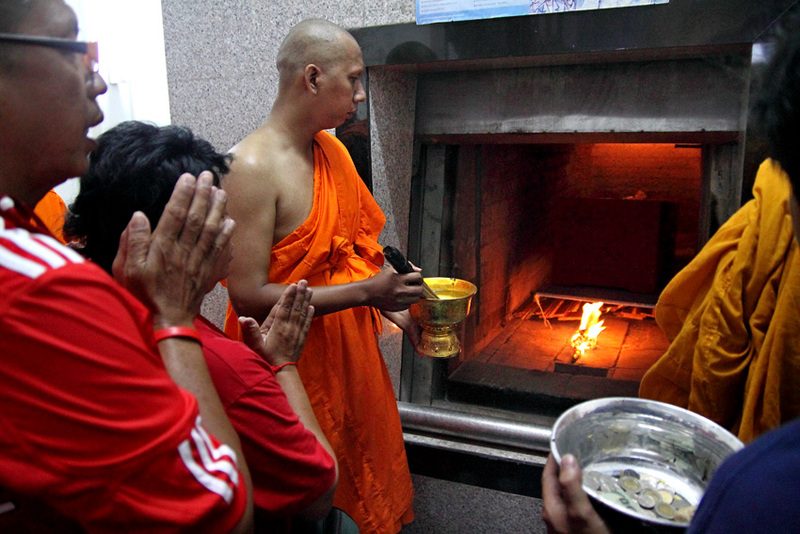 Somchai Wongsawat symbolically lit the pyre. Most people left then, and the more private part of the funeral began. 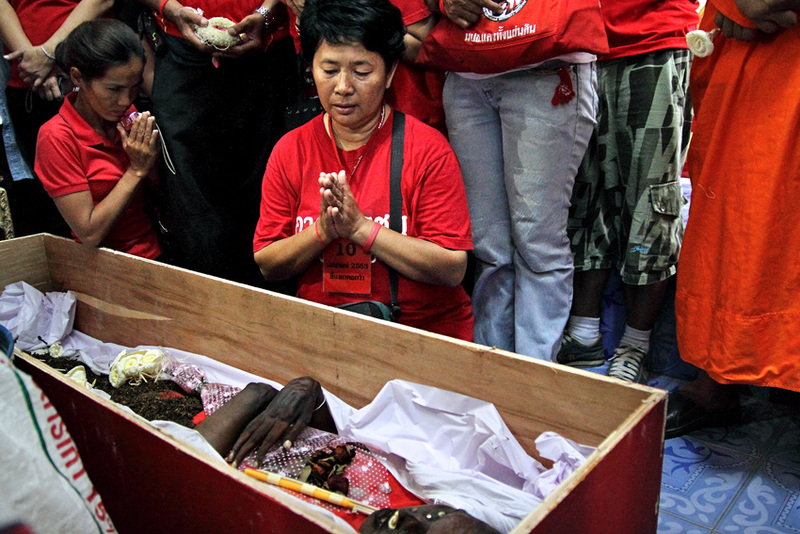 The parents decided to say goodbye to their son at an open coffin. The coffin then was placed into the crematorium. Terdsak’s parents and his younger brother who ordained gave their farewells. Terdsak’s close friends posed for a group photo with his parents. Excellent report once again. Thank you, Nick. It’s amazing that the MSM ignore events like these. 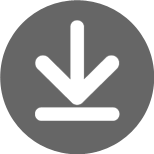 Without your reports there would be huge gaps in the historical record of this era. @ Micheal- I think that is exactly the point. Is it okay in Thai and Lao culture to see a deceased body, even if the condition of the body is highly decomposed, at funeral? I remember attending a Lao funeral of a Monk and the coffin was open. Excellent report Nick. Good to see you covering what is happening in Udon. Congratulations. Generally speaking, people have here a different relationship to corpses than in most western societies. As you can see – even taking images in these situations is perfectly permitted. If the family would not have wanted me to to take photos (or if i would have sensed that this would have been uncomfortable for the family) – i would not have taken these images. Other family members have taken photos as well there. I hope you are not suggesting that i purposely faked this story. I haven’t. Doing so would not just be against any professional ethics, it could easily cost me my press card and my work permit, and could get me deported from Thailand. 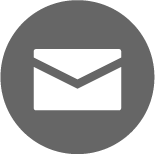 The same way – accusing me that i fake stories could earn the accuser a libel case, if i would feel inclined to file one. To reach the Udon Lover’s radio station one does not need to cross Udon City and jam the city, the easiest approach route is via the highway. 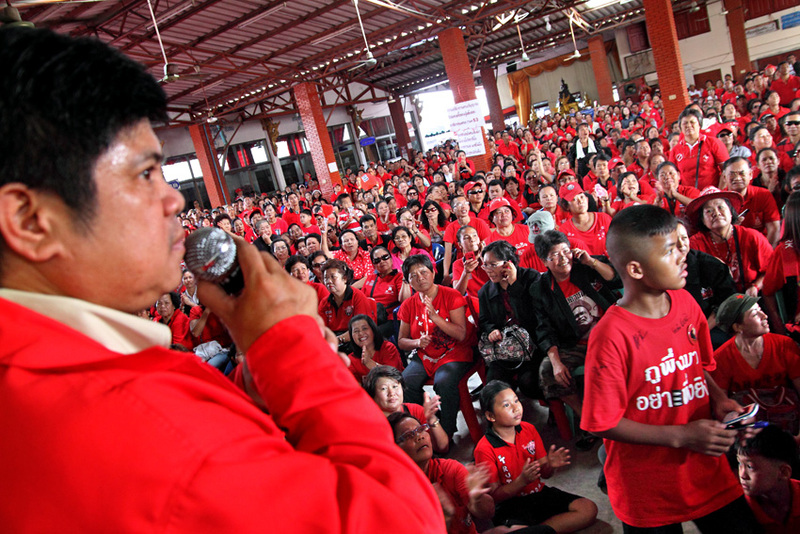 Red Shirts did not just come from Udon City, but from all over the province, from many other Isarn provinces, and even from as far as Bangkok. My calculation of people attending is quite transparent – the plot of land is 18 Rai, i deduct 2 Rai for stage and shops, that leaves 16 rai, which makes 25 thousand something square meters. I count 2.5 people per square meter (some count even 3 or 4, but i am a bit more conservative in my count), which results in slightly more than 60 000 people. Given that there many people sitting in the surrounding plots as well, and that there was a constant coming and going – i came to this number. To confirm if this rally took place i would suggest to ask police, or even better – drive to the radio station and ask there directly. Some comments just make you want to smile. Well, Udon got about 1.5 million population, having 80,000 people gathered is about 0.53% of the total population, certainly its possible to have a mass of 80,000 from the province alone. The Red Dragon. Did you smile at Mr. Nostitz response to Mike W.? 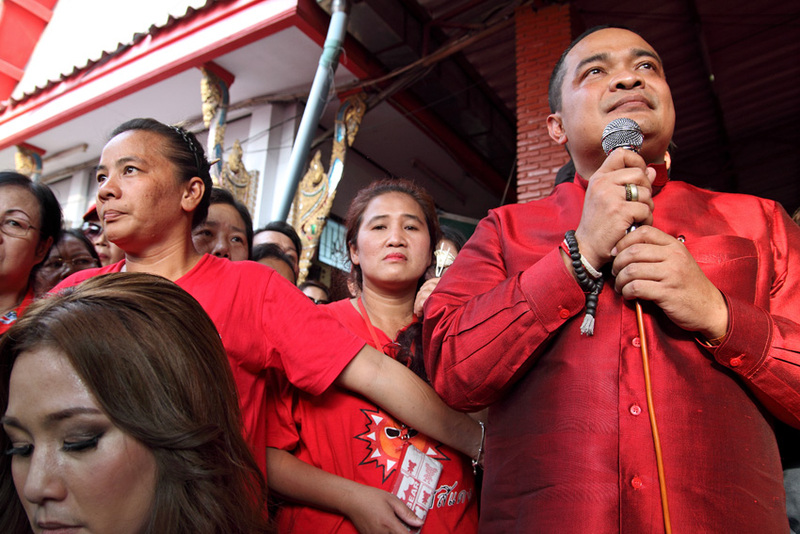 It is understandable that anti-red guys want to downplay the number of red gatherings whether they are held in Udon or Bangkok. Before its recent demise, the yellows claimed they came on their own despite their small number. 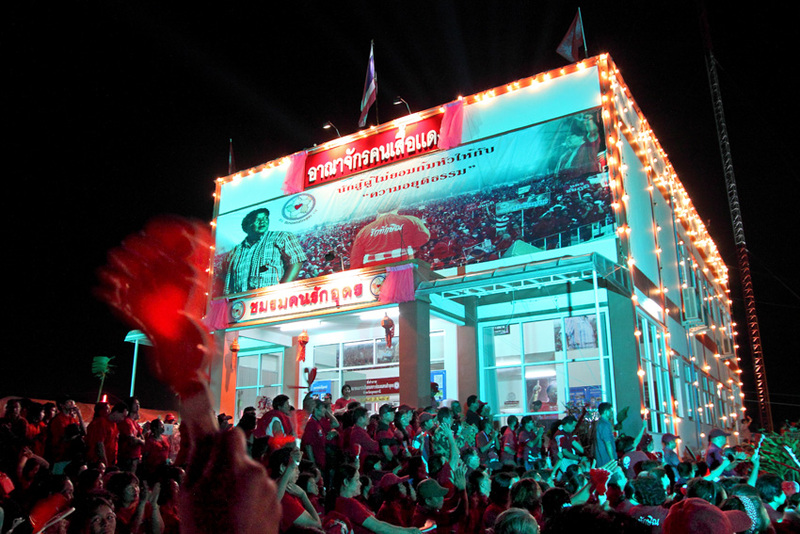 At the same time, they claimed Thaksin paid the reds to come to their rallies. That’s still a much larger percentage than the Bolsheviks had when they seized power in Russia ! tukkae #8 Thanks for those links. Nattawut has got to be the best orator since err ahh Adolph Hitler. That guy is a natural, he was made for a stage, its just a pity about his sense of humour its just so unnazi like, so my analogy breaks down. Was it the invention of TV that sidelined people with this kind of talent? Nothing like exploiting the dead for a movement still clearly run top to bottom by cleptocratic billionaire Thaksin Shinwatra and his cadre of foreign backers and local gangsters. Then again, that was the entire point of bringing in mercenaries on April 10, 2010 and ensuring a bloodbath took place. It’s much better to have actual bodies to exploit than made-up stories like after 2009. To answer Nick’s question as to why the media didn’t give it major coverage – they probably don’t see the merit in giving publicity to the crass exploitation of naive and impressionable people that should be learning trade skills instead of the tenants of social progress according to Peua Thai, and the crooked police colonel turned crooked billionaire Thaksin Shinwatra – who by the way, as Nick observed, is still the centerpiece of the UDD movement. ops sorry for the mistype I was looking at 0.053333333 and for got to push it up to percentage. Your crowd photo is blurry and is made up of 3 different photos! They do not show us an attendence as you claim! Propaganda at work on this side! Very dangerous. That was the reason why I posted the videolinks, so that you have another source and people like you can have a second look that will confirm Nick’s professionalsm. The crowd photos are not “blurry”, they are slightly grainy as they have been shot on 3200 ASA, 1/60 sec, and with F-stop 2.8 to 5.0 depending on image. And yes, of course, they are panoramic shots made up of 2 and 3 single images (clearly marked so as each of the single images has a black border). I have done so out of reasons of “visual language” (google that term, please), and because one single shot would have simply not been able to capture the size of the crowd. kireb – when a scene you want to photograph is so wide that you can’t get everything into one shot with a normal lens, you have to take two or more photographs and fit them together. Nick did that – and showed what he did by including the whole frame of each separate photo – not just for the crowd shots but also others. Without a distorting “fish-eye” lens, the only other way is to use a specialised panning camera that will move from one side to the other. That’s not practical in these situations – so Nick did the next best thing and was honest in showing it. If you think those crowd photos are too “blurry” to be clear, I suggest you visit an optician. If you want to believe they’re “propaganda” (fake), I suggest none of the facts here will matter to you anyway. Excellent piece of reporting, Nick ! I admire the way you keep a polite posture in your responding messages at all times, even when certain posters seem to just simply try provoke a reaction from your side with the most pathetic anti-theses.